I love this shot, it says so much in a very subtle way. Is the gray contagious or will the red spread? Awww, poor lonely, abandoned cart. Great shot! PippaD: Thanks! I wonder how long it has been there. Colleen: The cart was originally all red, but I kind of blotched it up to make it look more lonely and abandoned. Ashlee: Me too; whenever I see an abandoned cart. It looks like a Target store cart, but the store is miles away. Yakini: Thanks! I agree, no one to take it back home. I thought Target when I first saw it. great shot. It does seem lonely. that is one lonely cart. Carol: It misses its friends. Lina: I didn't notice that, but now that you mentioned it, I think it is calling for help! GrammyMouse: You are right, it was not found like that. I re-created it in photoshop to make it look more alone and weathered. the cart does look lonely. love the photo effects. Interesting. 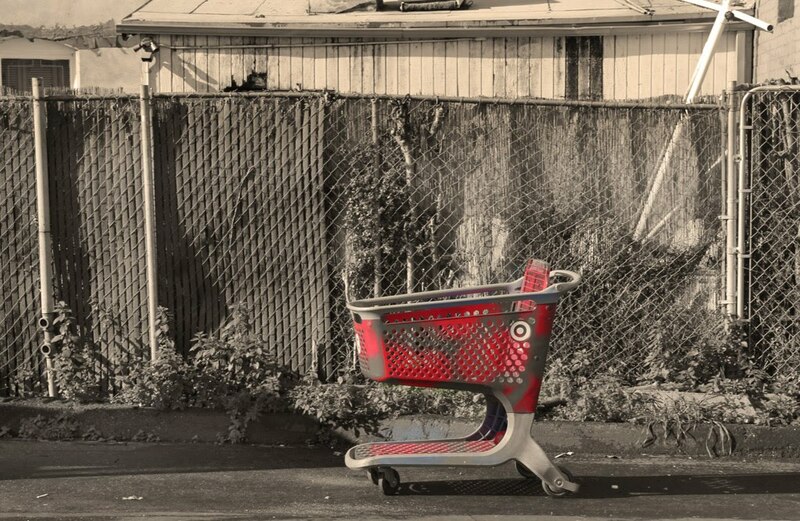 I like the contrast between the colored cart and the monochrome background. It gives it a very bleak appearance - I like it. Very creative and a cool shot. It does look lonely! Happy WW! Are you messing with us? I like it.